The 1969 New York Mets season was the team's eighth as a Major League Baseball (MLB) franchise and culminated when they won the World Series over the Baltimore Orioles. They played their home games at Shea Stadium and were managed by Gil Hodges. The team is often referred to as the "Amazin' Mets" (a nickname coined by Casey Stengel, who managed the team from their inaugural season to 1965) or the "Miracle Mets". 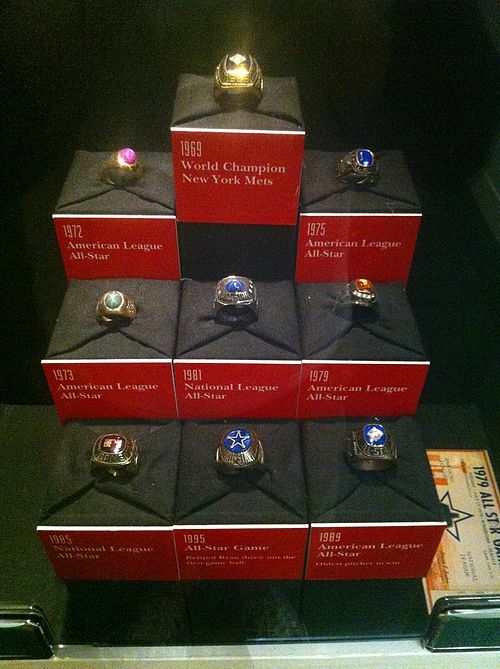 The 1969 season was the first season of divisional play in Major League Baseball. The Mets were assigned to the newly created National League East division. In their seven previous seasons, the Mets had never finished higher than ninth place in the ten-team National League and had never had a winning season. They lost at least one hundred games in five of the seasons. However, they overcame mid-season difficulties while the division leaders for much of the season, the Chicago Cubs, suffered a late-season collapse. The Mets finished 100–62, eight games ahead of the Cubs. The Mets went on to defeat the National League West champion Atlanta Braves three games to none in the inaugural National League Championship Series and went on to defeat the American League champion Baltimore Orioles in five games. First baseman Donn Clendenon was named the series' most valuable player on the strength of his .357 batting average, three home runs, and four runs batted in. On Saturday, August 22, 2009, many of the surviving members of the 1969 championship team reunited at the New York Mets' present park, Citi Field. February 5, 1969 Greg Goossen and cash traded to the Seattle Pilots for a player to be named later. Received Jim Gosger three months later to complete the trade. June 15, 1969 Jay Carden, David Colon, Kevin Collins, Steve Renko, and a player to be named later traded to the Montreal Expos for Donn Clendenon. Terry Dailey is sent on May 16, 1970 to complete the trade. The 1969 New York Mets held spring training at Al Lang Stadium in St. Petersburg, Florida, for the 8th season. 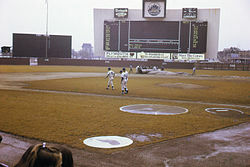 Shea Stadium prior to a game in September 1969. The Mets had never finished higher than ninth place in a ten-team league in their first seven seasons. As an expansion team, they went 40–120 in 1962, the most losses by an MLB team in one season in the 20th century, and the 1962 Mets' .250 winning percentage was higher than only the .248 posted by the 1935 Boston Braves. The Mets never had been over .500 after the ninth game of any season. Seven years after their disastrous inaugural season, "The Amazin' Mets" (as nicknamed by previous manager Casey Stengel) won the World Series, the first expansion team to do so. Despite that performance, the Mets suffered two mid-season three-game series sweeps at the hands of the Houston Astros, who manhandled the Mets all season, taking 10 of the 12 games the teams played. They were also no-hit by Bob Moose of the Pittsburgh Pirates on September 20, only five days after becoming the first major league team to strike out 19 times in a nine-inning game, a game they won, 4–3, on a pair of two-run home runs by Ron Swoboda, against the Cardinals' Steve Carlton. July 23: All-Star Game (NL wins—) 9–3 Carlton (STL) Stottlemyre (NYY) 45,259 RFK Stadium Washington, D.C.
With two outs in the top of the ninth inning, starting pitcher Jerry Koosman faced Orioles second baseman Davey Johnson (who later managed the Mets to their second World Series championship in 1986). After taking a pitch of two balls and one strike, Johnson hit a fly-ball out to left field which was caught by Cleon Jones. Three future Hall of Fame members were on the Mets' roster: pitcher Tom Seaver (who won twenty-five games en route to winning the Cy Young Award), a young Nolan Ryan (playing in his third season), and New York Yankees legend Yogi Berra (who briefly played for the Mets in 1965), who was their first base coach. Berra was inducted into the Hall of Fame in 1972, Seaver in 1992, and Ryan in 1999. The Baltimore Orioles boasted four future Hall of Famers on their roster: pitcher Jim Palmer, outfielder Frank Robinson, third baseman Brooks Robinson, and manager Earl Weaver. June 13, 1969: Al Jackson was purchased from the Mets by the Cincinnati Reds. June 15, 1969: Kevin Collins, Steve Renko, Bill Carden (minors) and Dave Colon (minors) were traded by the Mets to the Montreal Expos for Donn Clendenon. In the movie Oh, God!, God, as played by George Burns, explains to John Denver that "the last miracle I performed was the 1969 Mets." Part of the movie Frequency is set in Queens, New York, in 1969, as firefighter and avid Mets fan Frank Sullivan (Dennis Quaid) and his family follow the "Amazin's" throughout the World Series. In Moonlighting, Season 2, Episode 13, "In God We Strongly Suspect", when David is attempting to define the parameters of Maddie's skepticism and atheism by inviting her to provide logical explanations for various phenomena seemingly beyond man's understanding, he mentions the "'69 Mets" which she immediately dismisses as "a myth and a hoax". In his song "Faith and Fear in Flushing Meadows", twee/folk artist Harry Breitner makes mention of Tom Seaver and Jerry Koosman. In the TV sitcom Everybody Loves Raymond episode "Big Shots", Ray and Robert visit the Baseball Hall of Fame to meet members of the '69 Mets. In the film Men in Black 3, set shortly before the Apollo 11 launch in July 1969, Griffin, an alien from the fifth dimension who can see the future, says the Mets' title is his favorite human history moment for "all the improbabilities that helped". In the TV show Growing Pains, the family's name was the Seavers and their neighbors were the Koosmans. ^ "Seaver, Ryan and Koosman highlight Miracle Mets gathering to celebrate 40th anniversary of 1969 World Series Championship - mets.com: Official Info". mlb.com. ^ "Events of Wednesday, August 13, 1969". www.retrosheet.org. ^ snarfmatic (March 16, 2011). "New York Mets Win 1969 World Series" – via YouTube. ^ "Associated Press Athlete of the Year (male)". www.nndb.com. ^ Johnson, Lloyd; Wolff, Miles, eds. (1997). The Encyclopedia of Minor League Baseball (2nd ed.). Durham, North Carolina: Baseball America. ISBN 978-0-9637189-8-3.